What we’ve called Y Combinator’s European clone, Y Europe, has let loose with their first startup, Soup.io. Soup.io is very low friction take on life streaming that serves as an aggregator for a lot of your public social media feeds. There are a lot of startups trying to do social aggregation (Spokeo, ProfileLinker, MyLifeBrand, Fuser) . Paul Buchheit’s highly automated FriendFeed looks like one of the best so far, but Soup.io is another easy to use alternative despite being manual. Without needing to sign up, you can easily combine feeds from services like: Flickr, Digg, LiveJournal, Delicious, eBay, StumbleUpon, Twitter, Vox, YouTube, Zoomr, or any other RSS feed. 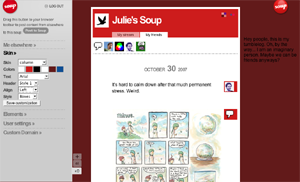 Soup.io also has a bookmarklet that lets users easily add content to their feed from around the web, turning it into kind of a tumble blog. 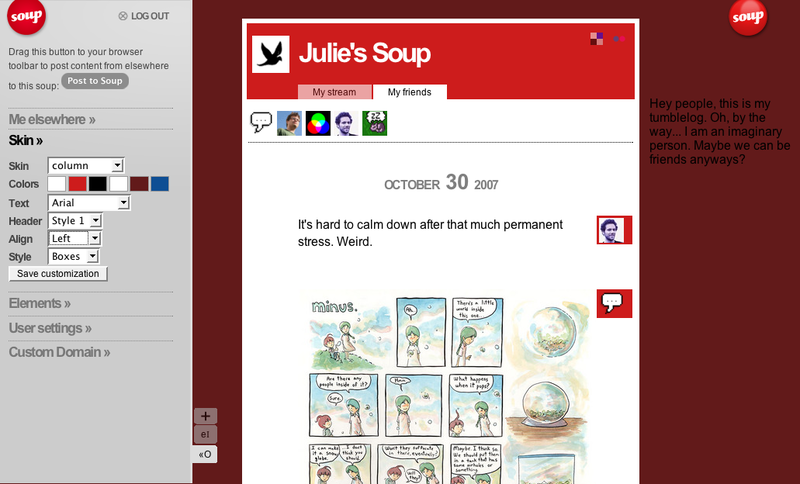 All the feeds are displayed in dated order on a customizable profile page. Signing up means you can connect with friends, follow their feeds, and link your feed to your own domain name. Each of these “life streaming” services is applying the news feed paradigm to the web, but not wrapped in the same sense of place and purpose as Facebook’s social network. Most life streaming services are just really simple RSS readers or replace a bunch of social networks with another somewhat clunky meta one. However, as social sites open up their information, services like Soup will benefit and the real question will change from how to aggregate your content, to what really interesting services you can run on top of them.